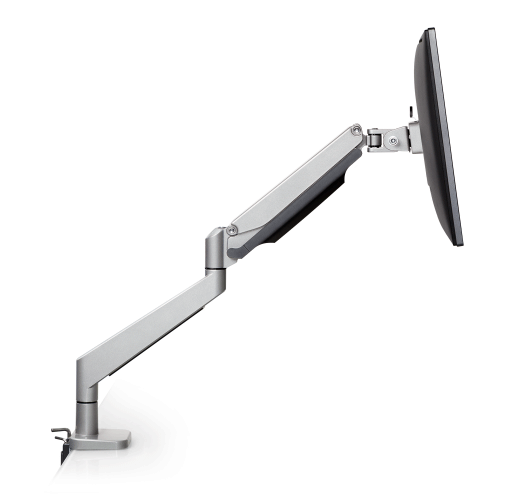 Envoy™ is the affordable yet powerful articulating arm for any workspace. Complement any office design while working in ergonomic comfort and saving space. Affordable yet powerful: Envoy™ brings the capabilities of a top-of-the-line articulating monitor arm to an amazingly low price range. Enhanced Organization: Sleek cable management system routes cables beneath the monitor arm, keeping your desk more organized than ever. One-touch adjustment: One-touch monitor adjustment means Envoy™ makes it easier than ever to place your monitor exactly where you need it. Quick & easy installation: Envoy™ monitor arms feature desk-edge clamp mounting and a quick-install VESA plate that ensures installation goes smoothly. Tension adjustment allows for seamless counterbalance. Effortlessly swivels, tilts and portrait to landscape rotation provide a wide range of movement. One-touch monitor adjustment. Sleek cable management system routes cables beneath the monitor arm. Detachable, quick-install VESA plate reduces installation time.VESA-monitor compatible – 75mm & 100mm VESA adapter included.Mounts to desk edge or bolts thru desk.